2018…what a year for PAMCo! Following our launch in April, we have gone from strength to strength. We’ve had three successful data releases and introduced new data and insights such as engagement metrics, data for mobile apps and newsbrand sections. Our efforts were recognised at the Media Weeks Awards where PAMCo won silver in the Best Trade Body Research category. 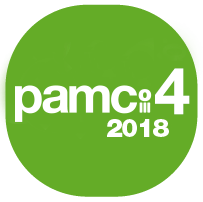 Today we release PAMCo 4, our fourth and final data set for 2018. The latest cross – platform audience readership figures, cover the period October 2017 to September 2018 (incorporating September 2018 Comscore data). The key benefit for users is the ability to isolate the contribution of each individual platform to overall brand reach. For every brand on the survey and for total market data, users can obtain a Venn diagram which details how many readers consume the brand on each platform and in combination. This data is easily obtained from the results section on the PAMCo website. For more about the possibilities of PAMCo, please take a read of this useful summary from the 2018 Publishers Conference by Mediatel: https://bit.ly/2Q8VGBG. We hope you enjoy the Christmas break…we’ll be back again in the New Year. Until then, Merry Christmas and a Happy New Year from the team at PAMCo! All results are embargoed until 00:01am on the 17th December. This means that the data should not be publicly commented on until after the embargo has been lifted and data released to the wider market. This release covers the period October 2017 – September 2018 for print data and September 2018 for Comscore data. Due to the different methodologies, the PAMCo Board have mandated that PAMCo data should not be compared with previous NRS data for commercial or marketing purposes. Please find below links to our latest series of infographics summing up the latest data release. These are very handy for downloading and adding to your presentations and client updates. Following a recommendation from the PAMCo Technical Committee, the PAMCo Board have decided to cease data collection for the PAMCo Panel with effect from January 2019, by which time data from almost 10,000 Panellists' digital reading behaviour will have been collected. The purpose of the Panel was to provide single-source data on the proportion of readers reading publisher brands in both print and digital, something which had not previously been available. The digital audience estimates themselves come from a data fusion with Comscore. 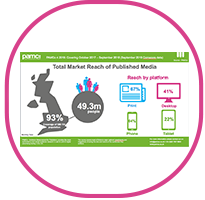 The PAMCo Panel data have confirmed that the fusion Ipsos carry out to integrate Comscore’s digital audience estimates with print readership estimates from the PAMCo survey is highly successful in capturing duplication of reading across print and digital publisher platforms. In most cases adjustments to match the ‘duplication targets’ generated by the PAMCo Panel result in monthly brand reach which is very close to that estimated by fusion alone. This is a strong validation of the fusion process. Adjustments will continue to be made on the basis of the data collected to date, however it has been agreed that ongoing data collection for the Panel is no longer necessary. There will be no discernible change in the PAMCo data as a result of ceasing Panel data collection. As part of the new PAMCo website, we have completely redesigned the subscribers section. Whilst you will be able to access topline data results on the open access part of our new website, the subscriber section will allow you more detailed analysis including an increased number of demographics to review. If you’d like to access the PAMCo subscribers section on the website, you will need to register for a new log in. Please click here to register. PAMCo reports on all digital entities and platforms that reach Comscore’s Minimum Reporting Standards (MRS) defined for panel data and are available on the MMX or MoMX subscriber interface. As of this data release, our dataset takes into account Comscore’s changes in their Multi-Platform MRS which is planned to be implemented on the Comscore interface in December 2018. Under the new Comscore rules, brands that meet the mobile panel MRS can be reported in PAMCo data even if they don’t meet the desktop threshold. As a consequence, some publisher entities have qualified for publication of digital estimates for the first time since we launched PAMCo and we now have brands reported for phone and tablet only, as well as for all digital platforms. 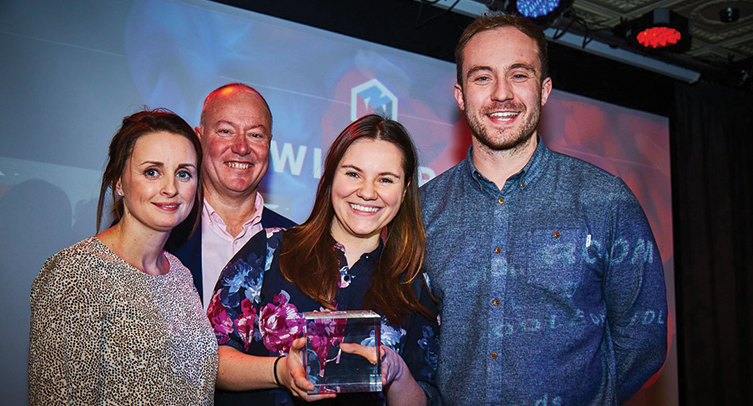 Congratulations to all winners at the 2018 Newsworks Planning Awards, and a particular well done to The Guardian and Starcom for both winning the Planning with PAMCo category. This is a new category introduced this year by Newsworks in support of the PAMCo launch. This email was sent by PAMCo.